GSA Today Geologic Past Series | KeaNeato! As managing editor for The Geological Society of America’s (GSA) science & information magazine, GSA Today, I develop and write “filler” articles to work in around the science and news as needed. Most (if not all) magazines are built in blocks of 8 or 16 pages. You can’t have an odd number of pages; therefore, there are times I need to quickly get another article or house ad into the issue at the last minute to round things out. In 2005 (my first year as managing editor of GSA Today, after serving as editorial assistant since 2003), I developed the “Geologic Past” series, pulling content from past issues of GSA’s first journal, GSA Bulletin (begun in 1889). The early issues of GSA Bulletin were not online, and I found some real “gold nuggets” in the older articles that I wanted to share with a modern audience. Since 2005, I have written 17 articles (two of which are “in press” [not published yet]). I have written the two in-press articles based on abstracts from GSA’s 1963 annual meeting, in keeping with GSA’s 125th anniversary celebration this year (which looks back at the past 50 years of GSA science). In the process of writing these articles, I always learn new, and to me, fascinating things, mostly based on the language in the article or the people involved. This is very much the case in one of the pending Geologic Past articles, and I have decided I want to pre-publish that article here. I don’t get a byline on the Geologic Past articles — it’s more or less implied that text without an author listed is written by the editorial staff (just me, in this case), and for this article, I’d like to know folks know I wrote it. Not for credit or anything like that — more to know what I find interesting (or NEATO) and, in this case, want more people to know about than just those (about 25,000 people) who read GSA Today. This one’s going into the April/May 2013 issue, unless I run out of room and have to cut it at the last minute. Editor’s note: this never did get into GSA Today. Speaking of cutting: I have taken out the first paragraph and title of the article because they don’t work in this context. Also, I have drawn heavily from the writing of others, and credit is given both in the text and a list of references cited at the end of the article. 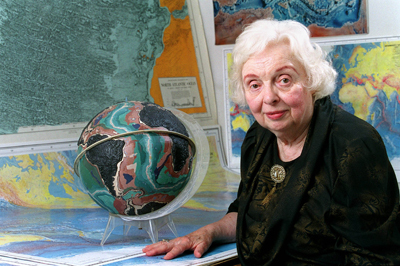 Marie Tharp and her globe of the seafloor. Image courtesy Lamont-Doherty Earth Observatory. In the past 50 years, much has changed in geoscience, not the least being the change in attitude toward the idea of continental drift from “an outrageous hypothesis” (Wise, 1963, p. 357) to the widely accepted theory of plate tectonics. The Mid-Oceanic Ridge, a tectonic belt nearly 40,000 miles long and 200–1500 miles wide that girdles the earth, has been offset in numerous places by transcurrent faults in the Atlantic, Indian, and Pacific oceans. Although the axis of the ridge, the site of a shallow-focus earthquake belt, is now being deformed, the fracture zones are aseismic except in the crest zone of the Mid-Oceanic Ridge. The flanks of the Mid-Oceanic Ridge are aseismic and presumably of considerable age. Recent investigations in the Indian Ocean reveal several north-south aseismic ridges and east-west aseismic fracture zones which together with the forked Mid-Oceanic Ridge produce a tectonic pattern much more complex than that of the other oceans. The team of Heezen (1924–1977) and Tharp (1920–2006) worked together from the mid-1940s to 1977. According to Cathy Barton, who wrote a biography of Tharp in 2002, the two “began mapping the sea floor to improve understanding of ocean-basin geology and to connect the oceans to the continents theoretically” (p. 215). During this process, writes Barton, Tharp “made an important discovery: a rift on the Mid-Atlantic Ridge.” It was Tharp’s interpretation of Heezen’s sea-floor data, says Barton, that “contributed to the reintroduction of continental drift theory and the 1960s geological revolution” (p. 215). Marie’s discovery of the trench in the middle of the Mid-Atlantic Ridge and her linkage of the major crustal plates for 40,000 miles around the Earth, showed us, and thus confirmed, the concept of plate tectonics and crustal movement. For the “non-drifters” of the time, which included their boss Dr. Maurice Ewing, this was a somewhat revolutionary concept which eventually erupted in conflicts, suspensions, and academic rivalry. Later in life, however, Tharp received many honors, including Columbia University’s first Heritage Award, the National Geographic Society’s Hubbard Medal, and the Woods Hole Oceanographic Institute Women Pioneers in Oceanography Award (North, 2008). In 1977, according to a New York Times obituary, Tharp was “honored by the Library of Congress as part of the 100th anniversary of its geography and map division.” The Earth Institute at Columbia’s Lamont-Doherty Earth Observatory established the Marie Tharp Fellowships in the Earth, Environmental, and Ocean Sciences to encourage women to study geoscience there. Barton, C., 2002, Marie Tharp, Oceanographic Cartographer, and Her Contributions to the Revolution in the Earth Sciences: London, Geological Society Special Publication 192, p. 215–228, doi: 10.1144/GSL.SP.2002.192.01.11. 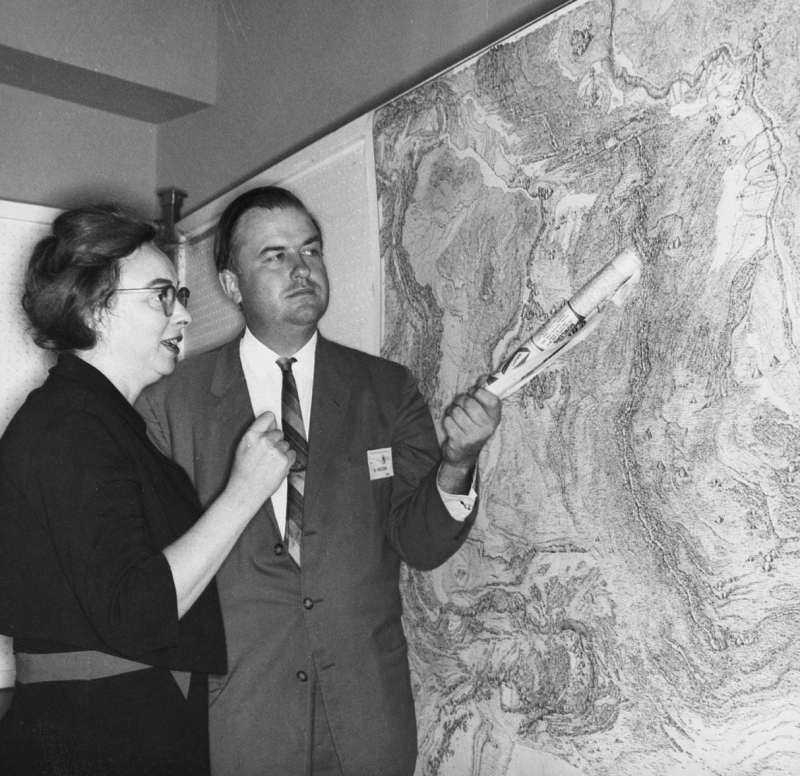 Bressan, D., 2011, Marie Tharp: The map that changed the world: History of Geology blog, 7 Oct. 2011, http://historyofgeology.fieldofscience.com/2011/10/marie-tharp-map-that-changed-world.html (last accessed 24 Jan. 2013). Felt, H., 2012, Soundings: The Remarkable Woman Who Mapped the Ocean Floor: New York, Henry Holt and Company, 240 p.
Heezen, B.C., and Tharp, M., 1964, Oceanic Ridges, Transcurrent Faults, and Continental Displacements, in Abstracts for 1963: Abstracts of papers submitted for six meetings with which the Society was associated: New York, Geological Society of America, GSA Special Paper 76, 1964, 341 p.
Mervine, E., 2010, A famous ocean floor map: Georneys blog, 24 Dec. 2010, http://georneys.blogspot.com/2010/12/famous-ocean-floor-map.html (last accessed 24 Jan. 2013). North, G., 2008, Marie Tharp: The lady who showed us the ocean floors: 2008 Geological Society of America Joint Annual Meeting, Abstract 523-10, http://a-c-s.confex.com/crops/2008am/webprogram/Paper41892.html (last accessed 24 Jan. 2013). Tharp, M., 2006, Marie Tharp bio: Woods Hole Oceanographic Institution, 12 Dec. 2006, http://www.whoi.edu/sbl/liteSite.do?litesiteid=9092&articleId=13407 (last accessed 24 Jan. 2013). Wise, D.U., 1963, An Outrageous Hypothesis for the Tectonic Pattern of the North American Cordillera? : GSA Bulletin, v. 74, no. 3, p. 357–362, doi: 10.1130/0016-7606(1963)74[357:AOHFTT]2.0.CO;2. Marie and Bruce and their seafloor map. Image courtesy Lamont-Doherty Earth Observatory. This entry was posted in educational, fascinating, science, Uncategorized and tagged Geological Society of America, geology, geoscience, GSA Today, history, mapping, Marie Tharp. Bookmark the permalink. They gave me a copy of that map and it’s been on the wall. What do I look for to find out what what appears to be a hole NE of Solomon Islands actually is? It’s very obvious on the earthquake maps.